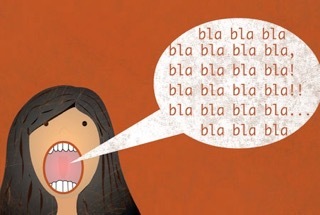 We've all done it - when we ask, persuade, cajole, beg, (insert your own words here) our kids, our friends, our co-workers - anyone for that matter, to do something, we ALWAYS use more words then necessary. See, I just did there. I should have said - we use too many words. We lose sight of what we actually want done, and instead lead the person down a path filled with flowery words that completely dull our message. We don't keep our eye on the prize. And we need to keep our eye on the prize. Here's an example - "It's going to rain soon and the weeds outside are getting really tall, so before it rains could you please go look in the garage for the weed killer, I think it's near the front. The ones on the side also are really looking bad and it's bugging me that they are there at all. So, please do that soon." I think I just asked my son to go kill weeds. I felt I was crystal clear, gave him my reasons why, and gave him clear instructions. It's going to rain, will I have to change my plans for today? The garage is a mess, where's that kite I was looking for? The side - which side? Which ones are the weeds? Instead of focusing on the goal - kill the weeds, I cluttered up my message so much he's not even sure what I want him to do. Go read my request again. I never even asked him to kill the weeds, I simply implied it. No wonder nothing gets done. My point here? When asking someone to do something - keep your eyes on the prize and frame your request ONLY TO THAT GOAL. "Please kill the weeds in the front and side before 3:00 today. I'm here if you have any questions." Clear, to the point, no misunderstandings. figure out what the goal is. frame your question with as few words as possible to that goal. stick to the what and by when. Asking in this way makes it easier to communicate what you want done and more importantly, it gives the person control over HOW they are going to do it. It gives them ownership. Which is one step closer to them actually doing it. They might not do it exactly the same way as you would, but as long as the goal is achieved, everyone wins. That's it. Try it the next time you want your kids, or anyone, to do something. Keep your eye on the prize, and talk to the goal.